Gov. 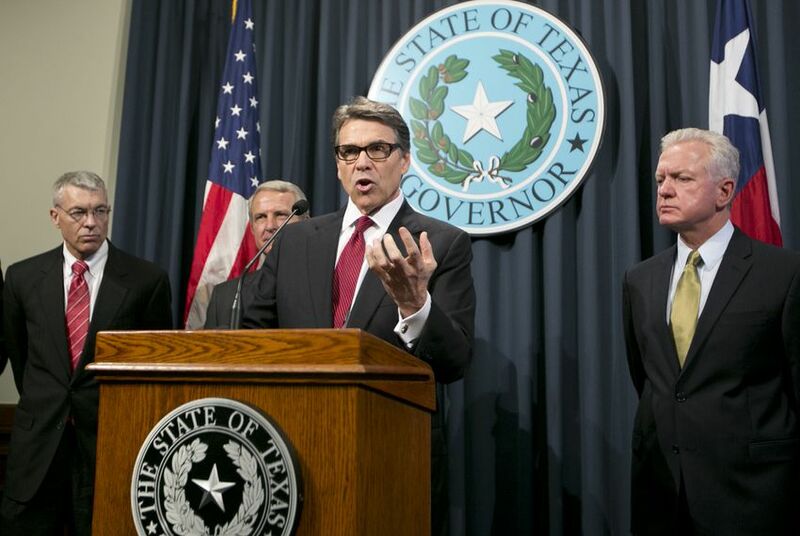 Rick Perry and other Texas leaders are pointing fingers at the Obama administration for botching the Ebola response. But the state did not use its own power to restrict travel and limit possible spread of the deadly virus. When the Ebola virus first arrived in Texas, Gov. Rick Perry greeted the grave news with trademark swagger. “There is no place in the world, I will suggest to you, that has better professionals, better ability to address this, than in Texas,” he said at a hastily called press conference, one day after Liberian national Thomas Eric Duncan tested positive for Ebola while in isolation at a Dallas hospital. Three weeks later, that early ebullience stands in stark contrast to the blame shifting and hand wringing that has broken out since Duncan died and two caregivers who contracted the disease were transferred to better-equipped hospitals in other states. Lessons are being learned from mistakes, Perry has readily admitted. But as public concern about the disease grows, he and other Texas leaders are pointing fingers at the Obama administration, asking for a ban on most flights from West Africa and criticizing the U.S. Centers for Disease Control for weak oversight. Meanwhile, a task force Perry assembled is recommending that the state give its health officials more power to quarantine people at risk for infectious disease. Missing from the official talking points is the reality that the state of Texas had full legal power from day one to order travel restrictions or impose quarantines on nurses or other health sector workers — indeed, almost anyone suspected of posing a public health threat — but did not use that power. Seven people were isolated, but not health care workers. Had the state used its public health powers more robustly, health care workers who treated Duncan might not have been circulating in public, and much of the ensuing panic could have been stilled. Amber Vinson, a 29-year-old nurse who treated Duncan, traveled to and from Ohio with permission from public health officials in Texas, who declined her request to send a private plane to fetch her from Cleveland after she learned a co-worker, Nina Pham, had come down with Ebola, her family said in a statement. And a lab worker who handled Duncan's biological material later boarded a cruise ship without issue or restriction. Texas law grants the state health department authority to quarantine people suspected of having contagious diseases. But unlike the seven people quarantined early on, health care workers who had been exposed to Duncan were allowed to self-monitor until it became clear they were at risk of contracting the virus. Of the seven people under quarantine, known as "control orders," four stayed in the apartment with Duncan, one was a homeless man who rode in an ambulance after Duncan did, and two others were unspecified “community members,” said Carrie Williams of the Department of State Health Services. As the Ebola scare turned into a full-blown media feeding frenzy, state and local health officials — who were consulting experts at the CDC — seemed to be drafting policies on the fly. The day Duncan tested positive, David Lakey, commissioner of the Department of State Health Services, told reporters there was no reason to isolate people who had come into contact with the patient. “If they don’t have fever, they don’t have diarrhea, they’re not going to spread the disease to other individuals, so they really don’t need to be in isolation,” he said. But a day later, Lakey's counterpart in Dallas County — Health and Human Services Director Zachary Thompson — said local authorities, working in conjunction with state and federal partners, would monitor the individuals and take responsibility “for ensuring that they do not get out into the public." Lakey then approved a mandatory control order for the four people who had been in the apartment with Duncan, saying it was necessary to ensure they would be monitored and not leave their home to potentially infect others. “I couldn't be confident that that monitoring was going to take place the way that I needed it to take place, and that's why I signed the control order,” he told reporters at the time. After Lakey issued the first control order, his agency emailed reporters a written explanation of its broad authority to isolate and, if necessary, quarantine people who have been exposed to the disease. "Texas law allows the state health department and the local health authority to issue control measures to a person who is ill with, has been exposed to, or is the carrier of a communicable disease. (Health and Safety Code§81.083). Control measures by law can include isolation, quarantine and preventive therapy. If a person does not follow these orders, they can be enforced by the courts, and the person can face criminal charges,” the department said. If those quarantined tried to violate the order, Attorney General Greg Abbott's office was ready to rush to court to back up state health authorities, according to Abbott spokesman Jerry Strickland. Vinson was not under a control order when she flew to Cleveland and returned to Dallas on Oct. 13 with a low-grade fever. Three days later, on Oct. 16, the state asked all people who had entered Duncan’s hospital room not to travel by plane, ship, bus or train, or visit groceries, restaurants or theaters for 21 days, until the danger of developing Ebola has passed. Before that order, health workers had only been asked to self-monitor for symptoms of infection. Perry, who was traveling in Europe when Vinson asked Texas health officials for help getting home from Ohio, later blamed the CDC for its "indefensible" decision allowing Vinson to board a commercial plan. But Vinson’s family said she was cleared for travel both by county health officials and the CDC. “Suggestions that she ignored any of the physician and government-provided protocols recommended to her are patently untrue and hurtful,” Vinson’s family said. They also announced they have hired high-profile D.C. lawyer Billy Martin to represent her. Perry spokesman Felix Browne said that neither the governor nor the Department of State Health Services was aware of Vinson's request for a private plane. Asked why the state did not use its authority to impose travel restrictions on health care workers who were potentially exposed to the virus, Browne said that before Pham got sick, the health care workers "were self-monitoring, per the guidance of the CDC." After Pham and Vinson contracted the virus, the CDC revised its guidelines on the protective equipment health care workers must wear while treating Ebola patients. In a related scare, a lab worker who handled some of Duncan’s biological material was allowed to board a cruise ship, triggering concern among fellow travelers. Carnival, the ship's operator, said in a statement that the worker “was not in a risk category that required restriction of movement” and had been self-monitoring her temperature. But after she boarded the ship, the CDC asked Carnival to monitor her more closely. The news caused some disturbance on the ship, and Mexico declined to let passengers make a day trip to Cozumel. As the public grew more fearful, Perry assembled a task force that, among other things, has called for legislation expanding the state's power to enforce quarantines. The task force wants the Legislature to give state health authorities that power for at least 48 hours, allowing them to use immediate arrest powers to prevent potential exposures before they occur, and allowing time to seek a court order to extend the control order if necessary. Not all medical professionals agree that individual freedoms should be restricted more heavily in the wake of the Ebola scare. Sean Kaufman, president of Behavioral-Based Improvement Solutions in Atlanta, says it is an individual’s responsibility not to travel. Kaufman helped train health care staff at Emory University Hospital, which treated U.S. aid workers Dr. Kent Brantly and Nancy Writebol, the first two Ebola patients to be treated on U.S. soil, and is now treating Vinson. Still, the Texas Ebola scare has exposed gaps in the Texas public health system's ability to cope with an outbreak of infectious disease. The Dallas hospital mistakenly released Duncan when he first showed up complaining of fever and abdominal pain — despite voluntarily disclosing that he had just flown in from the hot zone of Liberia. And officials repeatedly undersold the dangers of Ebola, while overselling the state's preparedness to deal with it. The day after Duncan tested positive, for example, Lakey told a packed press conference that the state had been preparing for Ebola long before the Liberian showed up at Presbyterian Hospital. "Since the outbreak of Ebola in West Africa, Texas has been taking steps to make sure that we are prepared for an event like this. A lot of education has taken place. A lot of protocols have been put in place," Lakey said. "We've been on the lookout for this." But a nurse at Presbyterian, Briana Aguirre, told NBC's Today Show that hospital officials never discussed Ebola before Duncan showed up. The state health services agency said that authorities shared Ebola preparedness information through its Hospital Preparedness Program listserv and regular epidemiologist conference calls with regional and local health officials. There was also a disconnect between what officials initially said, and what really happened when it came to the hospital's assessment of risk that its own workers faced. At the same press conference where Lakey spoke, Dr. Edward Goodman, an epidemiologist and infectious disease expert at the hospital, all but dismissed fears of Ebola spreading to health care workers who treated and released Duncan on the Friday he first showed up, and after he was admitted the following Sunday, Sept. 28. "We really think there is very little likelihood that any health care worker was exposed on Friday, and certainly virtually zero exposure starting Sunday,” Goodman said. Eleven days later, Pham, one of the nurses who treated Duncan, was diagnosed with Ebola, followed by Vinson a few days later. Though the initial optimism and confidence exuded by Perry and others appeared to be aimed at preventing widespread panic, a leading expert on infectious disease outbreaks said Pollyannaish statements from public officials can have the opposite effect. Dr. Michael Osterholm, head of the Center for Infectious Disease Research and Policy at the University of Minnesota, said in remarks broadcast on C-SPAN recently that research has shown "over and over again" that people get more frightened when they hear authorities say one thing but then watch something entirely different unfold. "If you tell them with certainty 'A,' and then you tell them certainty 'B,' and then A and B don’t happen, or they happen in a way you didn’t tell them, then they wonder about your credibility."